I’d like to think that walls listen to our conversations. Whether it be the words we speak behind closed doors- in the quiet of our own homes- the teaching that happens in a vibrant design studio, or the laughter echoing throughout an empty hallway, the rooms we sit in and pass through each day absorb the big and small moments of our lives. Gathering around Julia Child’s recipe for chocolate almond cake a couple of months ago carried with it many such moments. The voices heard that night somehow transformed those dim yellow walls we huddled under. 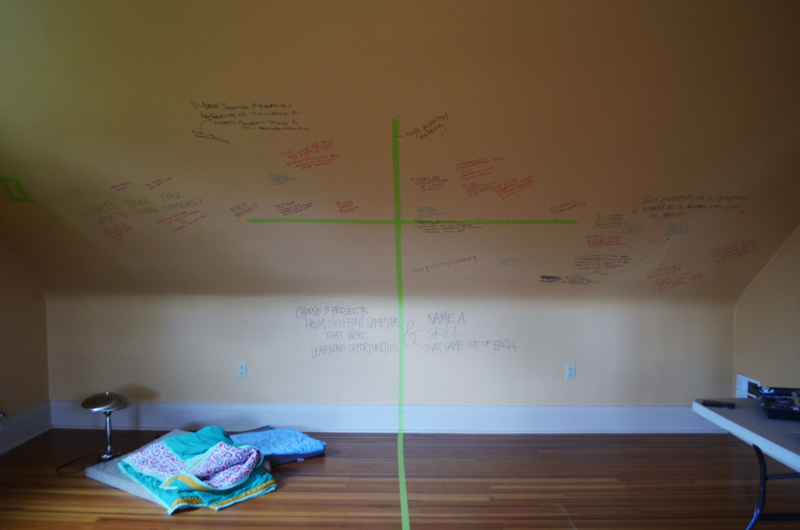 Returning again to this space in order to measure wall space for furniture, test paint color, etc. I knew that my new home needed to hear more from this group. 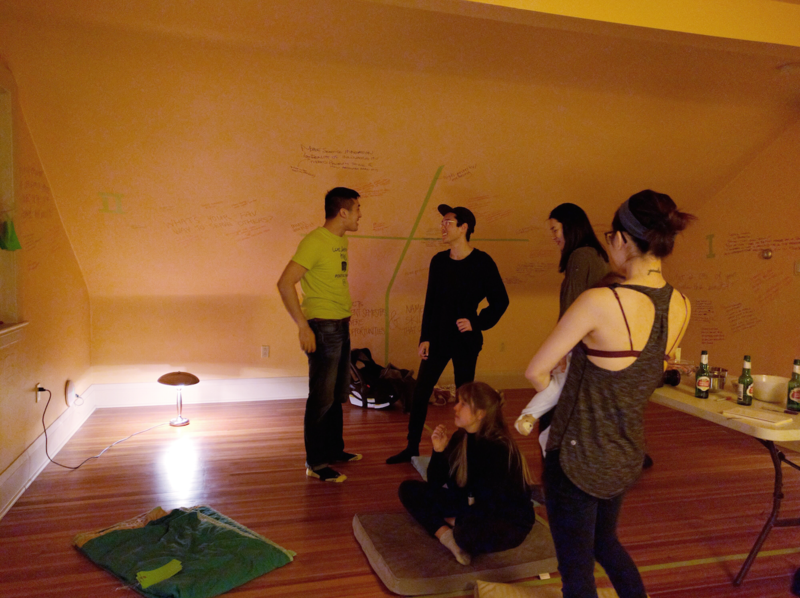 Considering the room itself as a partner in my continued exploration of collaborative communities, I designed another experience to take place in this same place.  The room was divided into four quadrants representing individual values and practices, and community values and practices. 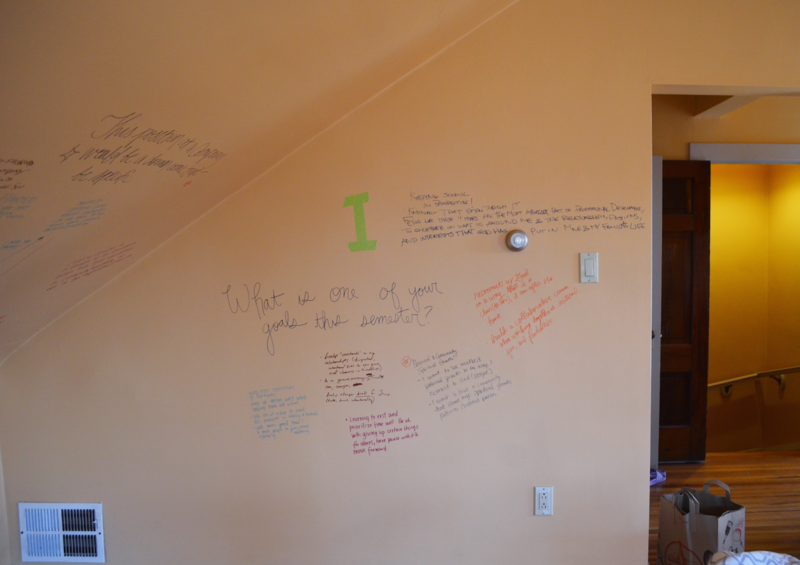 Coordinating questions were then written on the yellow walls to further investigate our hopes, dreams, and aspirations. The experience was designed with the intention to understand these eight friends of mine better. What inspires and motivates them to work, what areas of design are they excited about, and how can we take advantage of each individual’s strengths and reflect those in the group as a whole? 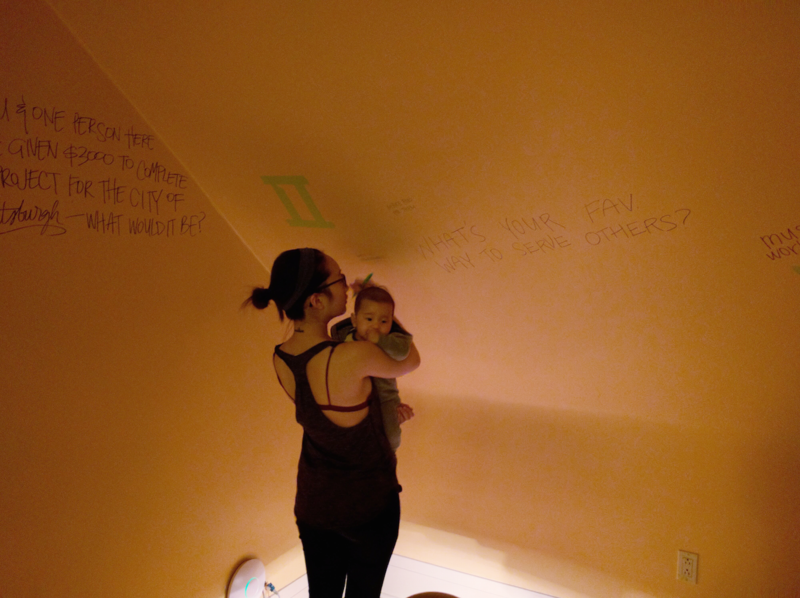 These are questions that I hoped would be answered by writing on my living room walls. 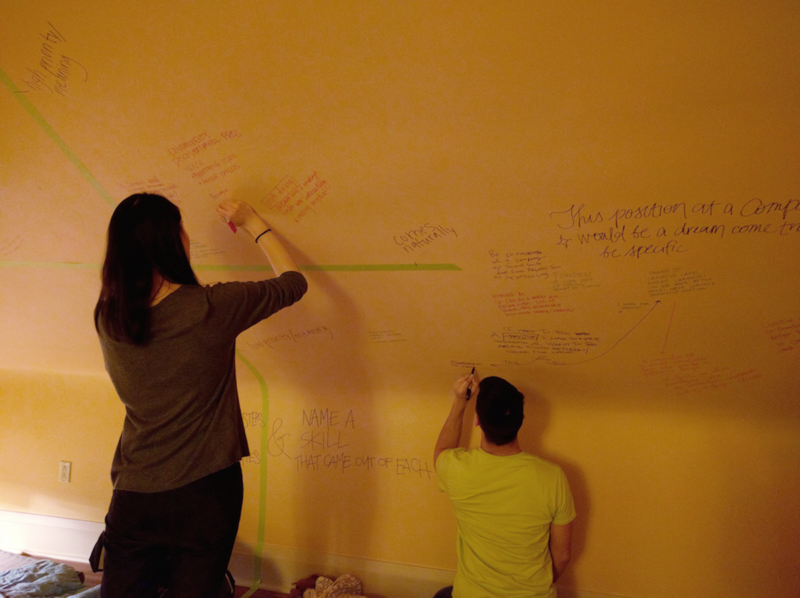 As the evening came to a close, the walls of my apartment spoke loud and clear of eight college students’ dreams for collaboration and community.